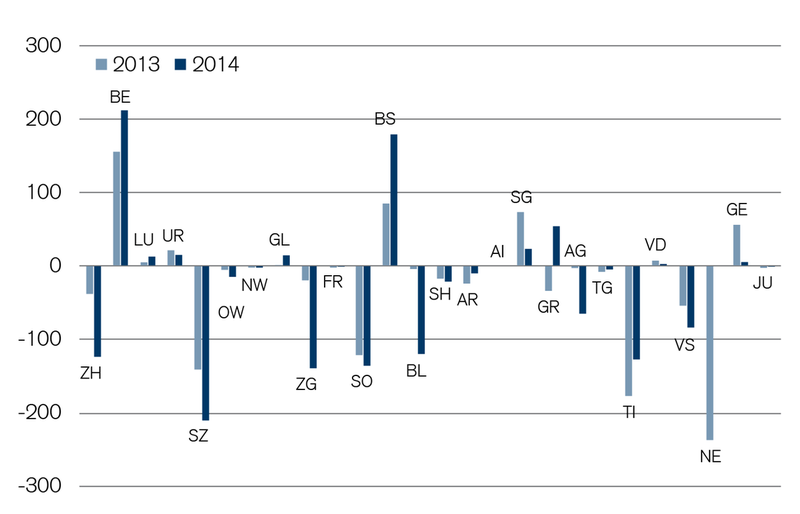 13 of Switzerland's 26 cantons showed a deficit in their accounts for 2014. With a few exceptions, the definitive accounts look slightly better than the budgeted figures in overall terms. Release of the annual accounts for Basel-Landschaft on April 29 means that all the cantons have now published their accounts for 2014. An even split exists between those cantons in the red and those that are in the black. The most frequently cited reason for the deficits is the absence of a profit distribution from the Swiss National Bank (SNB). A majority of cantons expect a deficit again in 2015. A double profit distribution from the SNB will nevertheless brighten the picture. A cumulative deficit of around CHF 1,060 million compares with a cumulative surplus of over CHF 520 million. Across all cantons this gives a deficit of CHF 540 million – a clear improvement compared with the previous year's deficit of CHF 793 million. The biggest deficit was posted by the canton of Schwyz at over CHF 210 million, followed by the canton of Zug at CHF 139 million. A lower-than-expected tax take (CHF –95 million) and one-off pension fund financing (CHF –40 million) were key to the negative outcome for Schwyz, while Zug likewise saw a reduction in tax receipts (CHF –55 million). By far the biggest surplus – as in the previous year – was shown by the canton of Bern with a figure of around CHF 210 million; this compares with a projected surplus of just CHF 10 million. The positive result was down to a significantly higher tax take as well as lower costs. This is enabling the canton of Bern to shore up its finances following a major deficit in 2012 and recovery in 2013. Many cantons projected a surplus for 2014 but actually ran a deficit – and vice versa. This shows how difficult it is to assess cantonal finances. Imprecise forecasts for tax revenues are the main cause of unexpected surpluses/deficits. As economic developments take a number of years to filter through to tax receipts, it is very difficult to arrive at a precise forecast. This is compounded by one-off factors such as the fact that in the cantons of Zurich and Basel-Stadt, for example, there was a reversal of provisions for the restructuring of cantonal pension funds while in Solothurn there was a CHF 40 million impairment on the canton's share in energy group Alpiq. The SNB produced a deficit of CHF 9 billion in 2013; in 2014, for the first time ever, it therefore waived its customary annual dividend of CHF 1 billion – two thirds of which goes to the cantons and one third to the federal government. But with the cantons having already budgeted for their share, which is based on population size, they were forced to retrench – in some cases considerably. Virtually overnight, Zurich for instance lost around CHF 116 million and Appenzell-Innerrhoden CHF 1.3 million. In nearly all of the 2014 cantonal accounts, therefore, the lack of a dividend is cited as the reason for discrepancies. In 2015, on the other hand, the SNB will come to the rescue of the cantonal budgets: A 2014 profit of nearly CHF 40 billion means the cantons are set to receive a double dividend (CHF 2 billion) in compensation, considerably enhancing their balance sheets. The discrepancies between budgets and accounts are likely to become even greater, however. Just eight cantons have budgeted for a – normal – SNB distribution for 2015, with three expecting a half share. Assuming a double distribution, this not only tips the budgets of Lucerne, Thurgau and Jura from the red into the black but also transforms the cumulative deficit of the cantons into a comfortable surplus. Despite considerable volatility, long-term patterns are evident in the cantonal financial results. After several years of almost nationwide surpluses (2006–2011), some cantons – which had already generated deficits prior to 2006 – slipped into negative territory again in recent years. 17 cantons recorded a deficit in 2012, 16 in 2013 and no fewer than 13 in 2014. The situation is striking in the cantons of Schwyz, Obwalden, Zug, Solothurn, Schaffhausen and Ticino, which constantly record substantial deficits. The opposite is the case in the French-speaking cantons of Fribourg, Vaud, Geneva and Jura, as well as the canton of Bern. 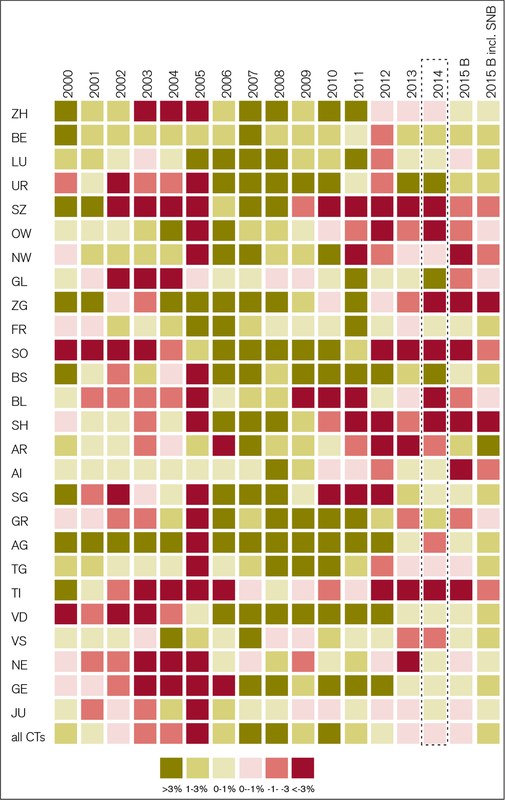 Balanced accounts or indeed surpluses have been seen in these cantons for a number of years. A glance at tax rates suggests the French-speaking cantons "buy" their positive results through persistently high tax charges for companies and individuals alike. The central Swiss cantons of Zug, Schwyz, Obwalden and Nidwalden have lower tax rates, but also very little budgetary scope. Although Schaffhausen posted its fifth deficit in succession, in a budget referendum held in mid-April 2015 voters rejected the austerity program that had been put forward by the government and parliamentary majority. Schaffhausen is therefore likely to remain in the red in the coming years. National fiscal equalization is a major item in many cantonal budgets, whether on the expenditure or the revenue side. The canton of Zug, for example, paid around CHF 280 million, or one fifth of its total expenditure, into the national fiscal equalization system in 2014. That equates to around CHF 2,300 per resident. Schwyz contributed CHF 142 million, 10 percent of its total expenditure or CHF 930 per person. This means the two biggest per-capita contributors to the fiscal equalization system recorded the biggest deficits of recent years. By contrast, the largest recipient cantons – Uri, Jura, Glarus and Valais – showed healthy balance sheets. Although the financial equalization system is based on resource potential and not on a canton's effective receipts, the situation has prompted donor cantons to initiate a debate about the level of payments. Regional disparities are also reflected in cantonal budgets in terms of hydropower. In the mountain cantons of Uri, Graubünden, Valais und Glarus – recipient cantons within the equalization system – considerable income is incurred in the form of water rates. These are paid by the power station operators for hydropower concessions. These revenues, which in some cases account for more than one tenth of the total revenues of the mountain cantons, are not classed as resource potential under the fiscal equalization system. This imbalance is likely to prove a hot topic in the event of any readjustment of the equalization system and to impact on cantonal finances. In overall terms, the cantons' annual results are on shaky ground. Even minor events and one-off factors can send things in the opposite direction. A majority of cantons have been in deficit for a number of years – a trend that is likely to continue in 2015 despite the unexpectedly substantial dividend from the SNB. Old Age and Survivors' Insurance (AHV) is Switzerland's problem child. Even the planned reforms are inadequate – the country should and must aim for a master stroke. Technology. More a blessing than a curse. Since the advent of the internet and the smartphone, if not before, technology has become a pervasive part of our lives. The 2018 Credit Suisse Worry Barometer reveals what people in Switzerland and the United States think about technology and its impacts.